Curling first appeared in what was still Czechoslovakia in 1990. First of all it was played by a group of enthusiasts who had to find not only the equipment but also the facilities necessary for playing this sport correctly. The facilities to begin with really were not of a high quality – it would be better to call them temporary as quality facilities, in the form of the hall in Roztyly, were only achieved after 14 years of hard work and effort. In the beginning not only equipment was sought but the association, clubs and players were also registered. Only after the association and the first clubs had been founded was there any hope of getting financial grants which provide difficult to obtain. At that time curling was an unknown sport and nobody knew what to expect from it in the future. The public did not have much information about curling so gaining new members and creating a membership base was not easy. Schools for beginners which were supported by the WCF (World Curling Federation) were organised to recruit new members. The WCF’s main support was in sending experienced teachers from advanced curling nations such as the United States, Sweden and Switzerland. It didn’t take long for Czech curling to find refuge in Vršovice in Prague where over the following years all competitions and tournaments were played. The players settled in at the HASA hall in Vršovice, partly thanks to the equipment they acquired in the form of stones and machines to treat the ice. After a relatively short amount of time the first successes were seen on the international stage. Czech curling began to make a good name for itself throughout Europe and the ECF (European Curling Federation) started to think it had a good future. Over the years not only has curling received exposure on satellite channels but there have also been occasional clips on Czech television. These attempts at publicity in the media always reach their peak during the Olympic Games. 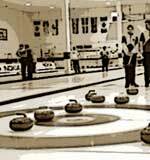 As a result, nowadays, there is no shortage of people who are interested in trying out curling or playing it as a form of recreation. At present there are more than 350 players registered with the Czech Curling Association (ČSC) who consider curling to be a part of their lives. Czech national teams regularly take part in the European Championships where they are achieving ever-improving results. Among the greatest successes so far was in 1994 in Sundsvall when the women’s team won through to group A and placed 8th. At the European Championships in 1998 in Flims the men’s team finished 8th in the elite group A. In 2000 at the European Championships in Obersdorf the men’s team again won through to group A. In the following year the women’s team again won a place in group A and in 2002, for the first time in the history of Czech curling, they kept their position in group A among the elite teams. Junior curling, however, has also achieved some great successes. The junior women took part in the 1995 Junior World Championships in Perth where they came 9th. The highest place achieved by the junior men’s team was in 1999 at the Junior World Championships in the Swedish town of Ostersund where they finished 7th. Czech teams play in tournaments throughout the year all over Europe and recently have recorded victories in several high-quality tournaments. Curling is a winter team sport where the emphasis is on strength, intellectual and other, not just, natural abilities. The main thing in curling is to respect your opponent and to be able to admit your own mistakes.